Kegco's HK38SSC-3 Digital Commercial Outdoor Kegerator is a high-performance triple faucet keg cooler that has been specially designed to be versatile enough to handle all of your commercial keg dispensing needs. The durable all stainless steel cabinet can withstand the elements in outdoor use and is front-venting to allow for both built-in and freestanding installation. 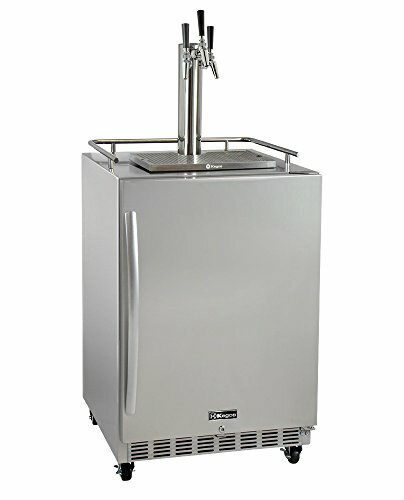 The wide 23-59 degree F temperature range gives you the option of dispensing kegs of beer, coffee, kombucha, or wine, and at 3200 therms, it utilizes the most powerful compressor in its class to provide unbeatable cooling for fast recovery and temperature pulldown. With the HK38SSC-3, Kegco has thought of everything you'll need to simultaneously dispense up to three kegs at a time in busy outdoor commercial environments, including an X-CLUSIVE Commercial Direct Draw Kit with the beer dispenser to ensure that you'll have all of the necessary high-quality commercial grade beer parts! Kegco's exclusive kit boasts a triple faucet polished stainless steel draft tower with an extra tall 14.5" height that takes the hassle out of filling normally hard-to-fit growlers and tall pint glasses. It includes three stainless steel Perlick 630SS faucets with a revolutionary design that will not stick, making them the most sanitary and reliable faucets on the market. In combination with the stainless steel probes on the keg couplers, the Perlick faucets ensure that your beer will only touch 100% stainless steel metal components from the keg to your glass. For maximum convenience, this kit also comes with a commercial grade regulator with two gauges that measure both PSI and CO2, taking the guesswork out of knowing when the corrosion-resistant, electric red epoxy-coated CO2 tank needs to be refilled. BUILT-IN OR FREESTANDING USE: Features a durable stainless steel exterior that allows it to be built-in undercounter to provide a seamless look in outdoor commercial applications. A stainless steel guard rail and casters are provided for applications where mobility is more beneficial. The attractive stainless steel door includes a lock to keep the contents secure, and both a towel bar and a curved handle are included for easy customization. INCLUDES EXCLUSIVE 3-TAP COMMERCIAL DIRECT DRAW KIT: Kegco's X-CLUSIVE Three Tap Commercial Direct Draw Kit comes complete with an empty 5 lb. aluminum CO2 tank with electric red epoxy finish, a Kegco YH-762 commercial-grade double gauge CO2 regulator, three ergonomic Kegco KTS97D-W "D" system lever handle keg couplers, a 3" diameter polished stainless steel draft tower with three stainless Perlick 630SS faucets for 100% stainless contact, and a 16" x 10" stainless steel drip tray. POWERFUL COOLING TECHNOLOGY: At 3200 therms, it has the most powerful compressor in its class, providing unprecedented cooling for fast recovery and temperature pulldown. Forced air refrigeration ensures that cold air is evenly distributed throughout the cabinet so there are no hot spots. Cold air is directed into the beer tower, ensuring that the lines are cold all the way up to the faucet so there's less foam between pours. DIGITAL TEMPERATURE DISPLAY: Easily adjust and view the set temperature, toggle between Celsius and Fahrenheit, or turn the interior light on and off with the push of a button. The controls can be accessed effortlessly at the front of the cabinet, out of the way of the dispense system. Temperature can be set between 23 and 59 degrees Fahrenheit, so it's cold enough for cold beer, coffee, kombucha, and even wine. LARGE STAINLESS STEEL INTERIOR: This kegerator measures 34-1/8" H x 24" W x 25" D and features a beautiful stainless steel interior that is more durable and easy-to-clean than the plastic liner found in many competing models. Enough floor space is provided to house a full size keg, two quarter slim kegs, or up to three 5 gallon kegs, and two adjustable wire shelves are included to allow you to covert the beer dispenser into a refrigerator when you are in need of extra cold storage.